ALBAUD (ALADIUS), the successor of St. Aper (Epvre) (15th September) as the eighth Bishop of Toul in Lorraine in present-day France. He served the See from circa 507 until his repose circa 525. While Bishop, St. Albaud completed construction of a church dedicated to St. Maurice of the Theban Legion (22nd September) which had been started by his predecessor, and rededicated it as the church of Saint-Epvre in honour of his predecessor. 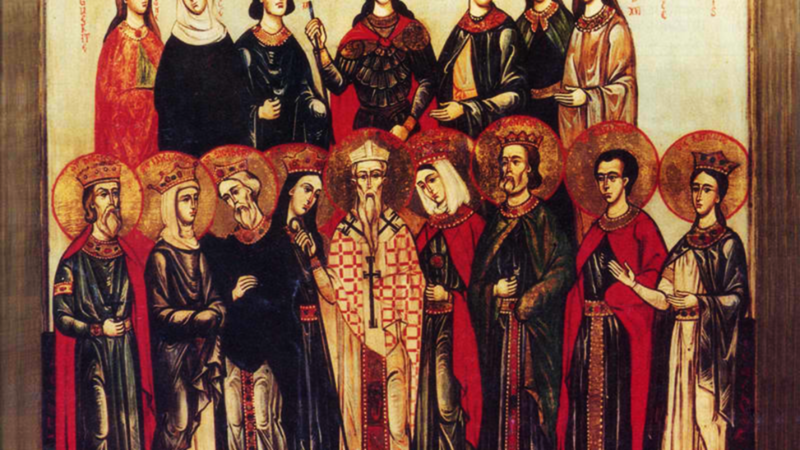 ARETAS and COMPANIONS, (Date Unknown), a group five hundred and five martyrs in Rome. Though mentioned in the Martyrology of Usuard , in sixteenth century ecclesiastical historian Cardinal Baronius' Annales Ecclesiastici , and subsequently included in the Roman Martyrology , they are absent from earlier texts, which has led some scholars to conjecture they may be the same as the Martyr Aretha and companions in Arabia Felix (present-day Yemen) commemorated on 24th October. BAVO, born to a noble family near Liège St. Bavo led a dissolute life in his early years and shortly after the death of his wife, was converted by St. Amandus (6th February). In time he distributed his assets to the poor and, founded an abbey in Ghent, which after his repose came to be called St. Bavo’s. In the final years of his life he lived as a hermit. St. Bavo reposed circa 654, at the abbey he founded. DODO, a spiritual child of St. Ursmar (19th April), St. Dodo received monastic tonsure at Lobbes Abbey, and later served as Abbot of Wallers-en-Faigne, in the diocese of Cambrai. St. Dodo reposed in 750. FIDHARLEUS, according to 17th century hagiographer and historian John Colgan, O.F.M., St. Fidharleus was the restorer, or second founding Abbot of Raithin Abbey. The exact location of the abbey is unknown, but it is generally believed to have been near present-day Longford, Co. Longford, Ireland. St. Fidharleus reposed in 762. MELORIUS, (Date Uncertain), St. Melorius is claimed by both the Cornish and Bretons as a native son and the subject of several legends. Unfortunately, there is no reliable information to support any of the legends, and it is highly likely there were several persons who might have become a composite known to us St. Melorius. PIATON (PIATO, PIAT), a native Benevento Italy sent by Pope St. Fabian (20th January) to enlighten Gaul, and is now known as the Apostle of Tournai (Belgium), and Chartres (France). It is thought he was martyred in Tournai during the reign of Maximian circa 286. REMIGIUS (RÉMI, RÉMY), Apostle of the Franks. St. Remigius, devoted his early life to secular and sacred learning, withdrawing to a small house near Laon, to live in reclusion and prayer. He became well known for his learning and holiness of life, that when a bishop was needed for the See of Rheims (459), the clergy and people proclaimed him the bishop, though still a layman and only twenty-two years of age. St. Remigius served as sixteenth Bishop of Rheims for seventy-four years, during which time he became the leading prelate in Gaul. The crowning event of this episcopacy was the baptism of Clovis, King of the Franks, and more than 3,000 of his soldiers in 496, which in turn led to the conversion of the Franks to Nicene Christianity; a landmark event in the history of Western civilisation. St. Remigius reposed circa 533. VERISSIMUS, MAXIMA, and JULIA, martyrs in Lisbon during the Diocletianic Persecution circa 302. Further details of their lives are no longer extant. VIRILA, abbot of the monastery of the Saviour in Leyre in Navarre who reposed circa 1000. Though there are many legends regarding him, aside from his being abbot nothing certain can be said about this saint.